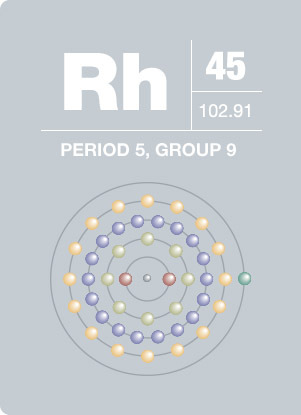 Rh3d region has well separated spin-orbit components (Δmetal=4.7eV). Coster-Kronig effect observed, broadening Rh3d3/2 component compared to Rh3d5/2, and making Rh3d3/2 component shorter than expected. 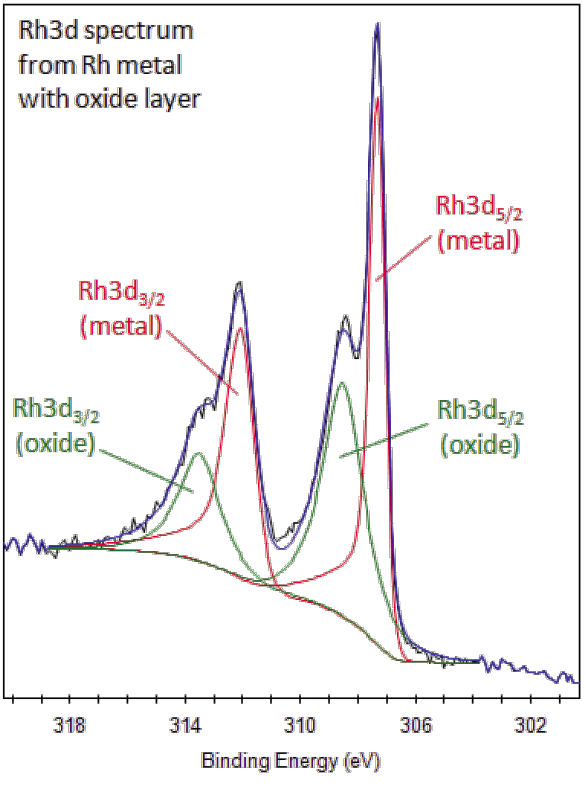 Rh3d peaks have asymmetric peak shape for metal. RhO2 may also have asymmetric peak shapes in some crystalline phases. This silvery-white hard transition metal belongs to the platinum group. It has high reflectance and is hard and durable. Rhodium is primarily used as an alloying agent with platinum and iridium to improve high temperature strength and oxidatlion resistance. These metal alloys are employed in furnace windings, electrical contacts, and high temperature resistance wires. As the pure metal, rhodium’s brilliance and resistance to tarnish makes it well suited for plating jewelry. This metal was discovered in 1803 by W. Wollaston and is named from the Greek origin “rhono,” meaning rose, after the rosy-colored solution yielded by its salts.